Students and staff say the show will be interactive and provide audience members with a unique experience. Shows will also run on Nov. 18. 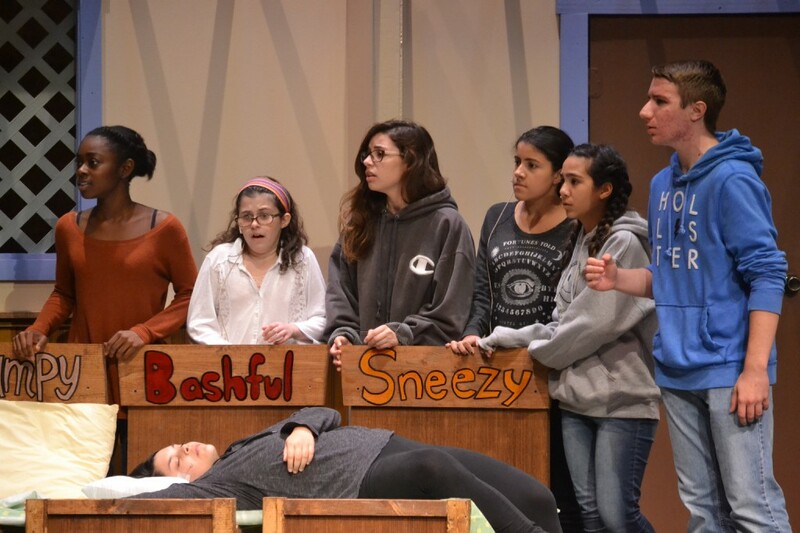 Lenape High School performers gather around a poisoned Snow White, played by student Emily DeSantos, as the group rehearses for Lenape’s upcoming production of ‘Snow White and the Seven Dwarfs.’ Lenape’s show debuts on Nov. 16. In addition to choosing a well-known, family-friendly story to perform, students and staff say the show is meant to feel like an interactive experience with its audience. When audience members walk into Lenape’s auditorium, they’re set to see a starlit sky along the ceiling and an arc of trees around the stage. As audience members take their seats, they’ll have a chance to purchase Snow White-themed tutus and hair ribbons, or candied apple slices and other candy treats to enjoy. When the show unfolds, at various points characters might even call out to the audience or march offstage and head down among the crowd. The show even encourages a bit of costume play among its audience, as the audience member who has the best Snow White costume at each performance can win a prize. Finally, when the laughs and cheers end and each show is done, younger members of the audience will have a chance to come on stage and have their picture taken inside the home of the Seven Dwarfs. Lenape High School student Emily DeSantos rehearses for her role as Snow White in Lenape’s upcoming production of ‘Snow White and the Seven Dwarfs.” Lenape’s show debuts on Nov. 16. 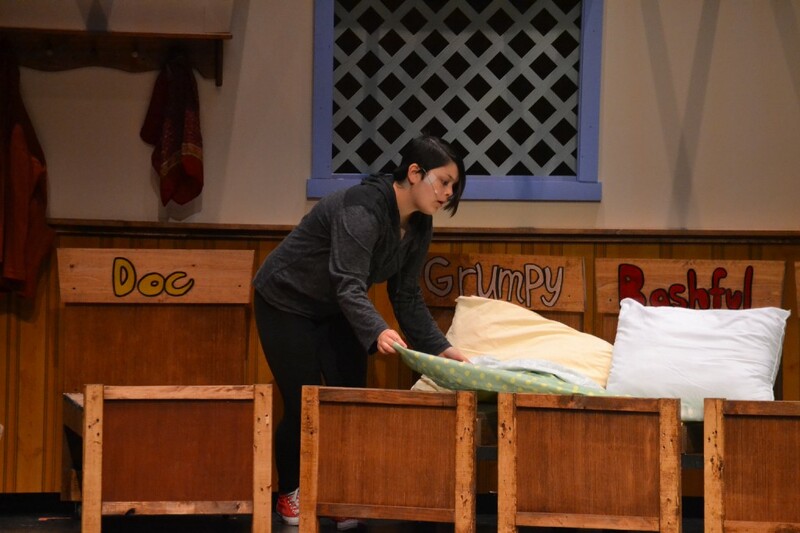 According to show co-director Alison Ciavaglia, the family event is simply meant to entice children and their families to visit Lenape and help bring a bit of fun into the school’s theater. “We have gone to a lot festivals this fall to promote the show and we found a lot of people were really excited and looking forward to having a fun family event that they could go to that was located at their local high school,” Ciavaglia said. “There are a lot of districts in the area that have elementary schools with a huge amount students as well as their middle schools, so we thought it would make our community show a little bigger,” Allen said. The show’s performers also say they’re ready to provide audiences with a show that’s a little different than normal. Leading the cast is Lenape senior Emily DeSantos, who is set to play the show’s title role of Snow White. DeSantos said Snow White is her favorite of all the Disney princesses, and so she’s not only excited for the opportunity to play the role on stage, but now she has the chance to bring other people into Snow White’s world as well. “People are going to get a really good experience. It’s very wholesome and very family oriented … and people will feel connected in way that hasn’t been done before with past shows,” DeSantos said. 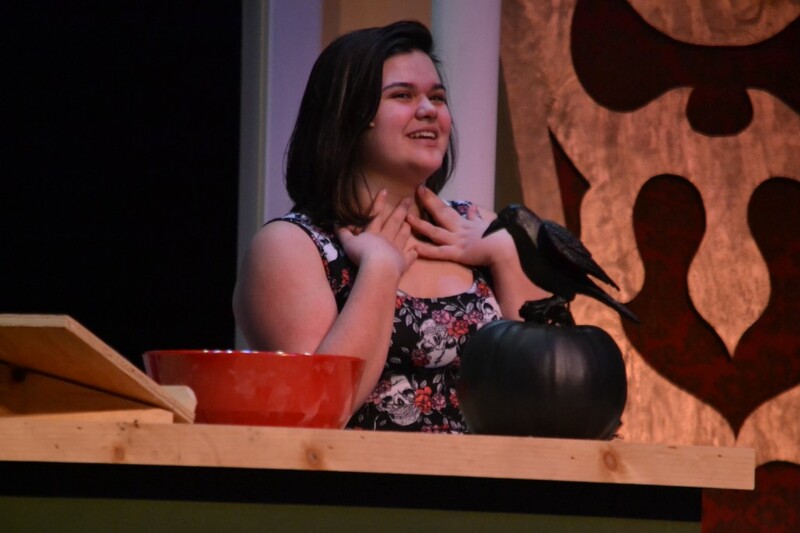 Lenape High School student Aniela Mazzola rehearses for her role as The Evil Queen in Lenape’s upcoming production of ‘Snow White and the Seven Dwarfs.’ Lenape’s show debuts on Nov. 16. Lenape junior Aniela Mazzola, who’s set to play the show’s antagonist in The Evil Queen, also shared DeSantos’ sentiments. Lenape High School’s production of “Snow White and the Seven Dwarfs” opens Nov. 16 at 6 p.m. The show will also run two performances on Saturday, Nov. 18 at 11 a.m. and 2 p.m.
Before the first show on Nov. 18, students will also host a character breakfast where kids can come see characters from the production and other well-known movies and stories. Tickets for the shows are $10 for adults and $8 for children and Lenape students. A $15 general admission combo ticket is available for the Nov. 18 character breakfast and 11 a.m. show.